When your grout lines get dirty or stained, you could mop it all day long and still not be able to achieve the pristine look it had when it was first installed. Tile cleaning is tough work. Grout cleaning is even harder, especially, if you’re using a toothbrush and elbow grease, but a quick phone call or email to schedule tile and grout deep cleaning services with Santa Fe Floor Care can change all that. Get ready for amazingly clean tile and grout. We service tile and grout floors, shower walls, tub surrounds, hot tub surrounds, pool decks, table tops, and more in both residential and commercial properties throughout Austin, TX. The degree to which grout can be cleaned is largely a function of whether it has been properly sealed and maintained. In the event that grout does not look uniform after cleaning, a remedy is color sealing the grout. We offer a variety of colors and can even come to your home, free of charge, and apply a few color samples to your discolored grout in an inconspicuous area. After it dries within 24 hours, you can choose which color you like best. Then, it’s just a matter of ordering the necessary materials and scheduling a day to color seal your grout. 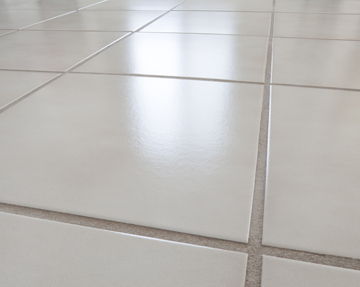 Once your grout is color sealed, you’ll have time to wipe up spills such as coffee, soy sauce, ketchup, etc. before they become stains, and your regular cleaning becomes much easier. Another unique advantage about the ColorSeal process is that your grout is protected by constant acting mildewcides. We also carry a full line of cleaners that you can use to properly clean and maintain your tile and grout surfaces. Visit our Caring For It page to view recommended products and download our FREE Stone and Tile Care Guide. For a FREE estimate on grout sealing and grout color sealing services throughout the Austin, TX area, contact us online or call (512) 632 1621 today.